An overnight trip past old kauri dams to The Pinnacles, on Coromandel Peninsula. Table Mountain • By Grayscale. Licence: C.
Bookings are required year-round for the Pinnacles Hut and Campsite. The Coromandel Peninsula was milled heavily for kauri timber during the early years of the Twentieth Century. Logs were floated down rivers by means of kauri dams. These dams were designed to release a flood of water that washed logs downstream. Many old kauri dams remain along this track which explores the Kaueranga Valley between Table Mountain and the Pinnacles. The Pinnacles - Thames • By CraigNZ. This track follows the Kaueranga River and Webb Creek up to Pinnacles Hut and on to the Pinnacles themselves (773m), returning via the Billygoat Walk. 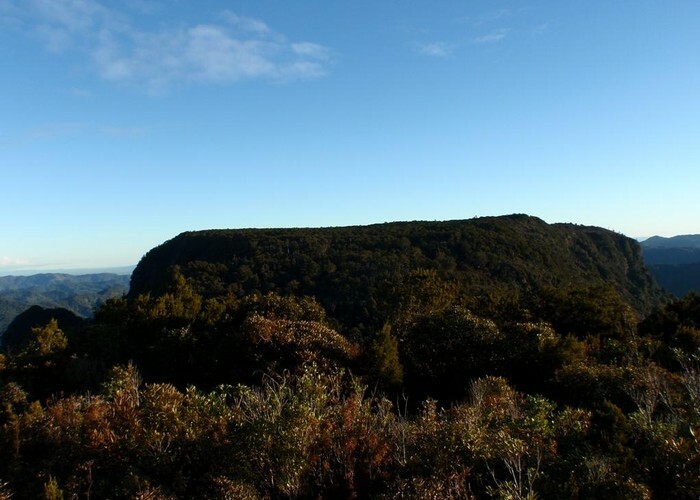 A challenging extension to the loop is to take the Moss Creek Track and visit Mount Rowe (794m). Table Mountain to the west rises to 846m with a very flat top, being the remnant stump of a peneplain. The route up Table Mountain has been described as the world's worst hike. The track has largely overgrown and disappeared. From the road end, a swingbridge crosses the Kaueranga River, with a track leading upriver to Webb Creek where the Moss Creek Track branches off. An historic packhorse route leads steeply up Webb Creek to the Hydro Camp and the northern end of the Billygoat Walk. Steps on the route were cut not for human feet but for packhorses. 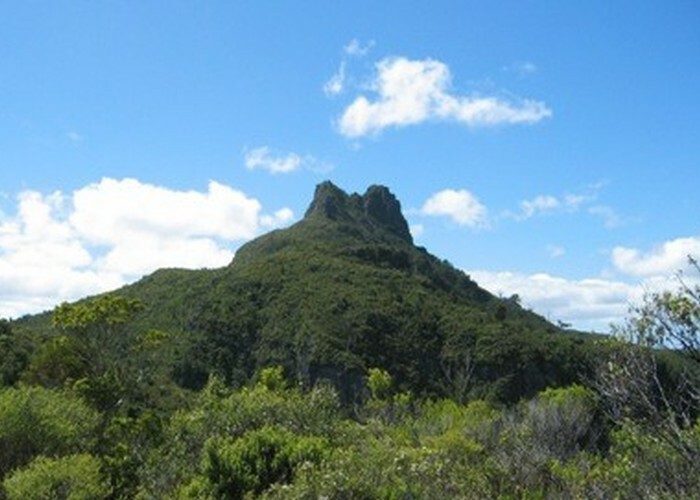 From Hydro Camp, the track sidles a holl and leads along a soft ridge to the large Pinnacles Hut. The Rangihau Track leads north just short of the hut. Pinnacles Hut (Coromandel) • Serviced Hut (DOC). Capacity: 80.Bookings required. A short walk from the hut leads to the Dancing Camp Dam and campsite. This dam was built 1921, and has been restored. Dancing Camp campsite • Backcountry Campsite (DOC). 5 spaces. From the hut, it is a straightforward walk south east on a steepening stepped track to the Pinnacles, a rocky outcrop. Good views from here on the exposed summit. Returning, follow the track back to Hydro Camp and turn off onto the Billygoat Track. This track climbs briefly before dropping into Billygoat Basin and crossing Atuatumoe (Billygoat Stream). There is a campsite near here along with the site of a collapsed trestle bridge. The track leads past a 180m waterfall and drops to the Kaueranga River. Billygoat Clearing campsite • Backcountry Campsite (DOC). 12 spaces. Added 1 July 2001 by MatthewMatthew. 6 revisions, most recently 19 July 2017 by MatthewMatthew. 1,117 views in the past year (93 per month).